not only is this my halloween outfit, but it is my "go giants" outfit. bonus. thanks to my roomie for the tutu. This watch has been sitting in my jewelry box for almost five years due to a dead battery and I got it changed today for $10 around the corner of my office. The convenience of New York is amazing. I lurve it. My dad shaved today after having a mustache for forty years. That means that I have NEVER seen him without it and it is freaking me out!!! I didn't know that Lucy wore a skin tight mini dress.....but apparently this "Lucy" will this weekend. went to the premiere of driving miss daisy tonight and then the after party at the plaza hotel. so fun to have a reason to be dressed up. spent part of my evening at the met. 1. I love my life here. 2. My apartment is great as you already know if you viewed the videos I made a few weeks ago. Every time I talk to the doorman, take the elevator, do my laundry, take the shuttle to Columbus Circle, and take out the trash, I count my blessings. 3. I have hit the ground running with my job. So far I have been learning a lot and it has been really great to be able to manage some projects already. Last week I went on a business trip to Toronto and I didn't buy a single thing or take any photos in Canada. It was a whirlwind of a day and after sitting in a cab for approximately 4 hours total and then 3 hours on a plane and an hour in a cab line at the airport for a 2 hour meeting, I was ready for a nap. 4. After hearing my two bosses talk all day, I have started thinking in a British accent, and words are already starting to come out with a bit of an accent sometimes. 5. My boss finally knows that I'm Mormon. I accidentally lied to him about it the other night at a party, so I had my coworker talk about it casually yesterday while I was out of the office for a minute. Lucky for me, he had been drinking when I accidentally lied, so it was easy to cover up. 6. I am going to the UK in a few weeks for work. Woot! 7. Apparently I am into crafting. My roommate loves finding treasures on Wednesdays in the service corridor of our building and I am always fixing something up. This black frame thing was hanging on the wall in our living room and I thought I would spice it up for Halloween. I would like to thank my roomie for the lovely ghosts. The camel ghost is my personal favorite. When I pull things like this off, I find the proof that I am my mother's daughter. Another one of Stef's treasures was a nightstand for me. She knew that the one in my room was on the verge of falling apart, so she dragged one upstairs for me last week. I wanted it to match my other bedroom furniture, so I bought some cheap craft paint and painted it while watching a movie in my church clothes on Sunday before going to dinner at the Bishop's house. I think it turned out great! 8. I was called as the Activities Co-Chair at work last week. It is my lot in life. we are worried about you - are you ok? the mail has not been sorted and it smells like something has died. 10. A few people have asked me if I miss San Francisco and I have to say that I don't miss SF yet, but I do miss all my peeps. You know who you are, Amy, Kristine, Rita, and Rachael. Come visit me. 11. You may have started wondering how I had my old neighbor's email address? I googled his name and found his psychic hotline website, so hopefully he knew that I was going to email him. Then again, if he was a psychic, he should have gone somewhere else to die since it is really stinking up the place. 13. Last night I went to 3 different stores trying to buy clothes. First go at it, the only things on sale were tank tops despite the 70% sale in the window. Second go, I picked out a bunch of cute clothes and then saw the line for the fitting room and it was about 20 yards long, so I put all my clothes on the nearest rack and left the building. Third go round, I tried on clothes with no line and then looked at the line to check out and saw that it was about 20 yards long. So I hung up the clothes again and walked out. I got home, got in bed and bought everything online, didn't have to shlep it home, and got 20% off. 15. Have I told you yet about the time that I went to Canal Street, stepped into the secret passageway, went underneath the building and up to the secret room where all the good purses are? You know what my email is if you want to know where that place is. I got 2 awesome purses and am happy to pass along good information when I have it. 16. Girls in New York even think Chris Nixon is hot and like to ask me about him. 17. Went to the Morris-Jumel Mansion on Saturday with Melissa. Apparently it is haunted, but I didn't see any ghosts. But I did some very large hairs coming out of the man's nose who was giving the tour. And not from the nostrils. I'm not sure which is grosser. 18. I am still on my diet in case you are curious. Oh yeah. You heard me. please note that it is nowhere near cold enough to wear my new coat. I wrote out a long post the other night all about the things that I have been up to - and then the internet timed out or something and I lost it. stay tuned. my new rain boots came in the mail today. crocs are one of the best things that has ever happened to me. 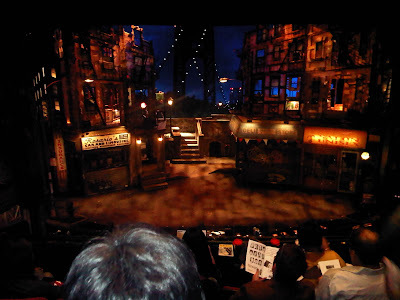 Went to see "In the Heights" tonight with a friend; really liked it except for the part where Jordin Sparks had the night off. Lame. Tonight, I carved a pumpkin at FHE. Diamonds are a girl's best friend. Most of you won't really understand the significance of this video, but to say that I was averse to taking out the trash at my last apartment would be an understatement. Something to do with a roommate telling me about someone sleeping by the trash can and there being unwanted items left over in the morning. If you want details on that, just ask; it is a true story. So - my new apartment is pretty awesome and so I made this video for Rachael and Rita to show them why all the extra rent is worth every single penny. Well kids, I'm here. Kristy and I made it to New York City in one piece. To help the time pass by on our drive, we listened to "The Hunger Games" books 1 and 2, yelled "Peetah!" as often as possible, rocked out to the satellite radio in our rental car and to the CDs that Amy made for our journey. Really, the trip was uneventful and other than Kristy having to pee every 2 hours on the dot, there is nothing to report. We arrived around noon on Saturday and after going to Target and spending half my life savings on things like hangers and a few pots and pans we returned the rental car at the airport and then Uzi and I went to Brooklyn to have dinner with Scott and Annie. That night I told Kristy that I keep waiting to feel some sort of anxiety or something about living in New York, but it all still seems very surreal and I feel fine about it. My apartment is awesome - I'm working on uploading a little video tour of my place, so stay tuned for that. My new roommate seems real cool and nice and we already have plans to go upstate together this weekend with a few other friends. I know where the grocery store and the drug store are (within a block of my house) and how to get home from the closest subway. Today I am running errands and doing things like getting my drivers license and figuring out how long it will take me to get to work if I walk. Last night my mom called to check in on me and when I told her that I was just sitting on the couch with Kristy and my roommate and we were trying to figure out what we were going to be for Halloween, she seemed very disappointed. For now, I am out to run the previously mentioned errands, but in the meantime, please imagine me doing more exciting things like having breakfast at Tiffany's or shopping at Sak's on Fifth Avenue.